Behind the strange name of Arvoesine lies a retro platformer game that was previously released as a shareware product. Now the game is available to all as a freeware title in the official website. In Arvoesine the player is a Roman warrior with the typical sword and shield and even throws a few spears along the way. He will need to fight the best that he can, since the world is filled with strange creatures and bosses. 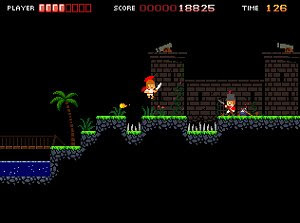 As the author himself says, this is a short game with only five levels (a good player may finish it in under ten minutes, if he knows all the dangers that await him) but that may bring back fond memories of classic 8-bit titles such as Wonder Boy and Ghosts’n’ Goblins. The game features really smooth animation to go with the tiny but detailed pixel-art graphics.